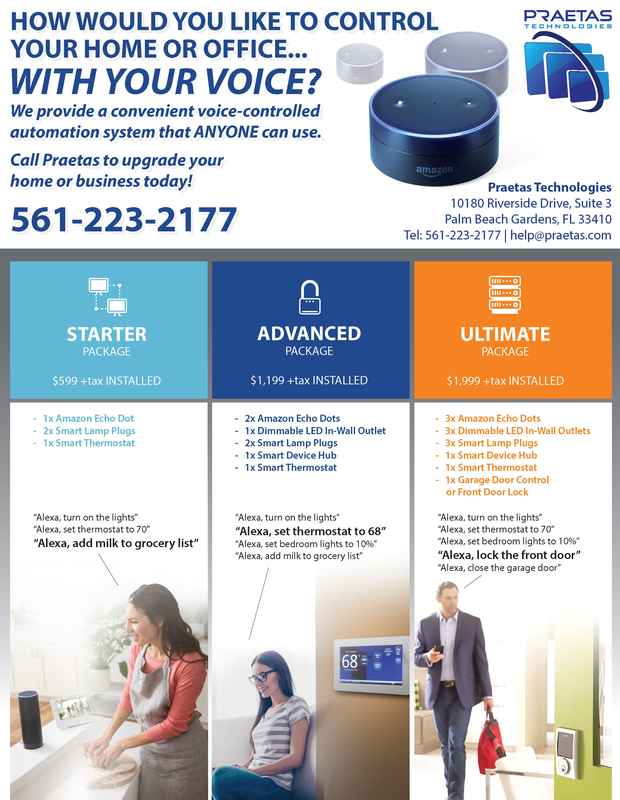 How would you like to come home and say “Alexa, trigger I’m Home” (the Amazon Echo goes by “Alexa”), causing it to trigger turning on all the lights, turning the thermostat down, and turning on the TV. Or maybe at bedtime saying “Alexa, trigger Goodnight” and having all the lights and TV system turn off, the thermostat set to your favorite sleep temperature, lock all the doors, and set your ADT alarm system?​ Or just laying in bed and saying “Alexa, set Hallway Nest to 70 degrees”? Sounds AMAZING, doesn’t it? In addition to custom computers, networking and camera systems, Praetas sells and installs this voice control experience using a variety of Home Automation and Internet of Things devices such as the Amazon Echo, Google Home, Wink Smart Hub, Smart Thermostats, Smart Lutron Wall Outlets and Dimmers, Smart Garage Door Controls, and Logitech Remote Systems. We are on the cutting edge of retail, consumer-grade home automation equipment and especially VOICE CONTROL. 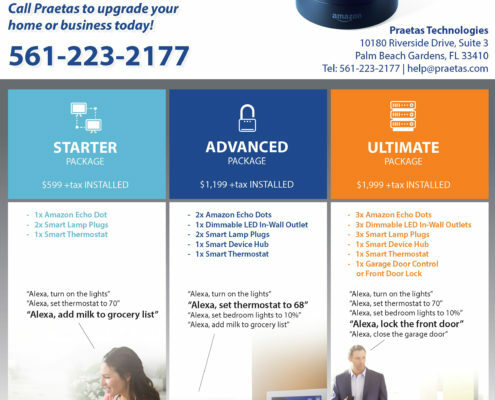 This is the next-level of home and office convenience and automation, and best of all it’s AFFORDABLE! You can find our Home Automation bundle package information to the right, but of course custom configurations are entirely possible as well. It’s a fast-paced and exciting automated world we live in and Praetas is here to help guide you through it.